After returning from our trip to the US in late March, Tawn and I had a conversation about the food in Bangkok that we really miss when we are away. In my mind, this list is much shorter than the list of food from San Francisco I miss now that I live here. 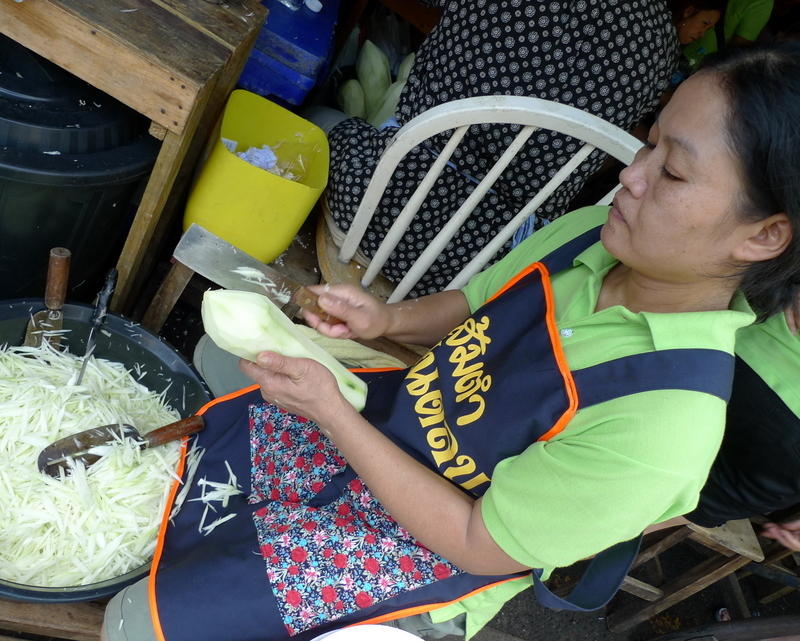 One of the Bangkok foods that did come to mind was the gai tod (fried chicken) and som tam (green papaya salad) served at Foon Talob (ฝุ่นตลบ) at the Chatuchak (sometimes “Jatujak”) Weekend Market. Foon talob translates as “dust all over” and the idea is of a Northeastern Thai (Issan) style roadside restaurant, a place where there would be dust all over the place. 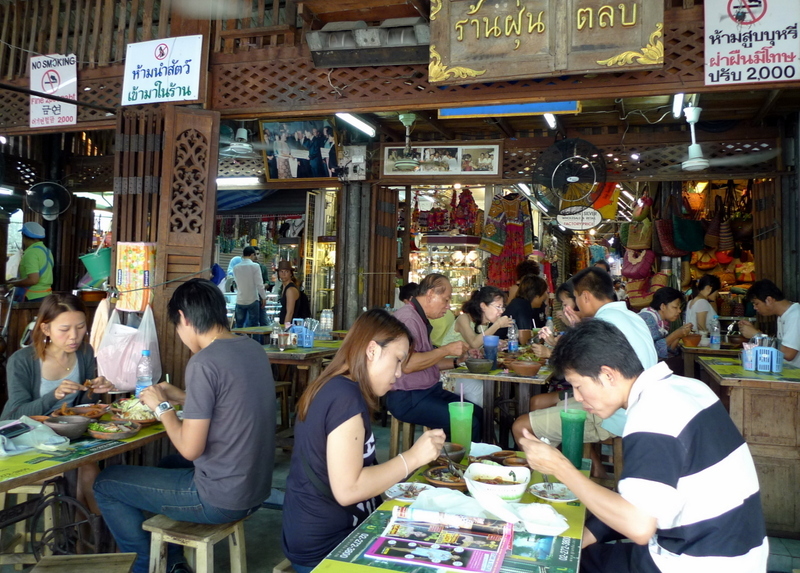 The restaurant is open air but covered, adjacent to a paved walkway and rows of stalls. In the hot season it is quite warm. But even then it is quite popular, filling up by early afternoon with everyone sitting shoulder to shoulder and back to back in the tightly spaced rows of tables and stools. Next to the open air kitchen is a little offering for the gods, a bit of food, sticky rice, and water with the ashes of incense scattered on the plate, a request for good fortune and business success that day. I’m inclined to think that fried chicken is one of the most universal foods. 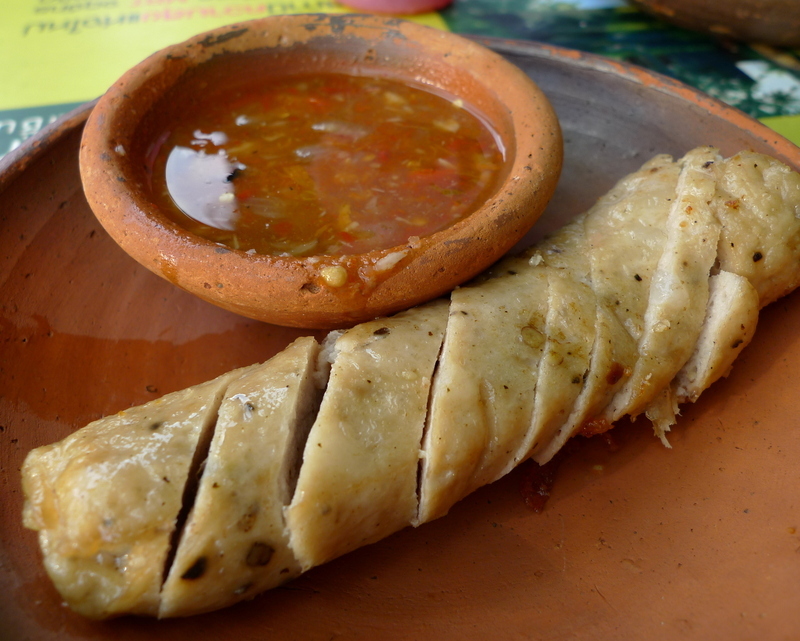 So many cultures have fried chicken … even before KFC arrived! Here, freshly butchered chicken is breaded in a heavily seasoned coating and then dropped into a wok of boiling oil. The end result is crispy on the outside but tender and juicy on the inside. It is served with two sauces: The one in the back is really spicy and the one in the front is mostly sweet with only a little spice. 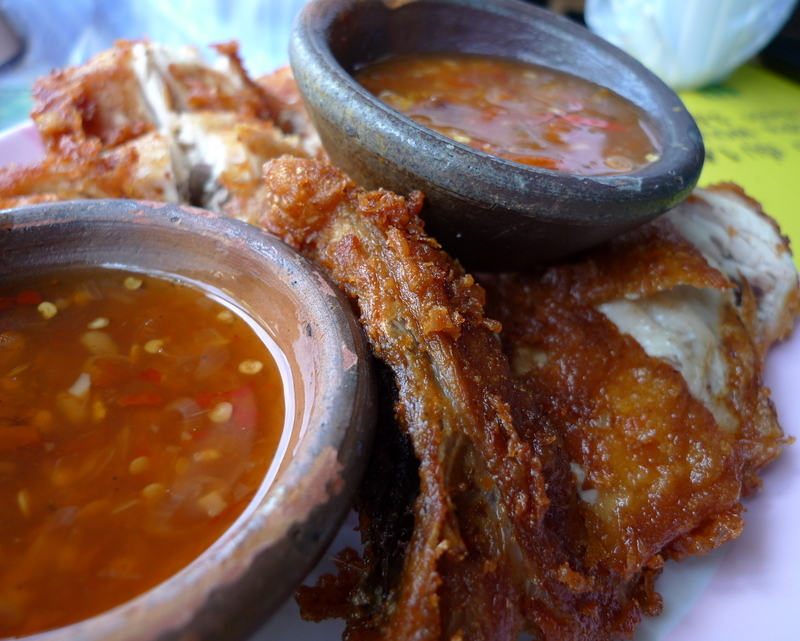 Always, always, always, the fried chicken is eaten with a bowl of sticky (glutinous) rice. Fried chicken just isn’t Issan fried chicken without a side dish of som tam or green papaya salad. Hundreds of green papayas are shredded each day to serve the customers. 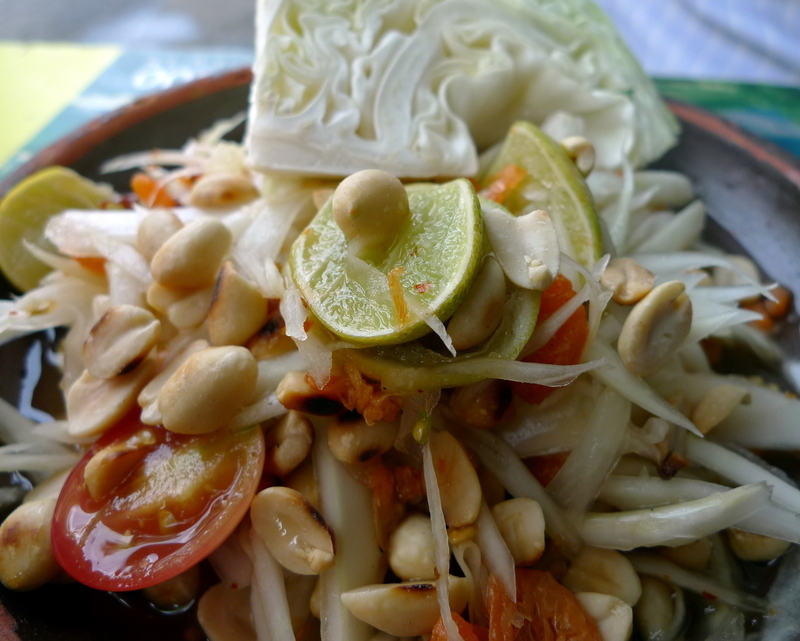 To the green papaya is added lime, tomatoes, dried shrimp, peanuts, sugar, fish sauce, and chilies. 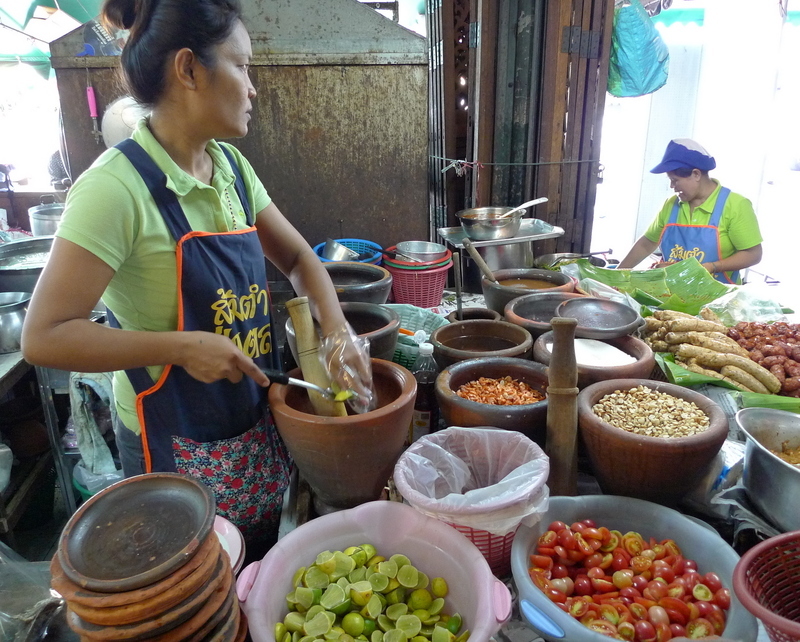 The mixture is pounded with a mortar and pestle, making a sound that in Thai is described as “pok pok…” providing a handy synonym for som tam. The end result is a tangy, sour, slightly salty, and often very spicy salad that is really refreshing in the hot weather. Another popular side dish is laab (sometimes Anglicized as “larb”). 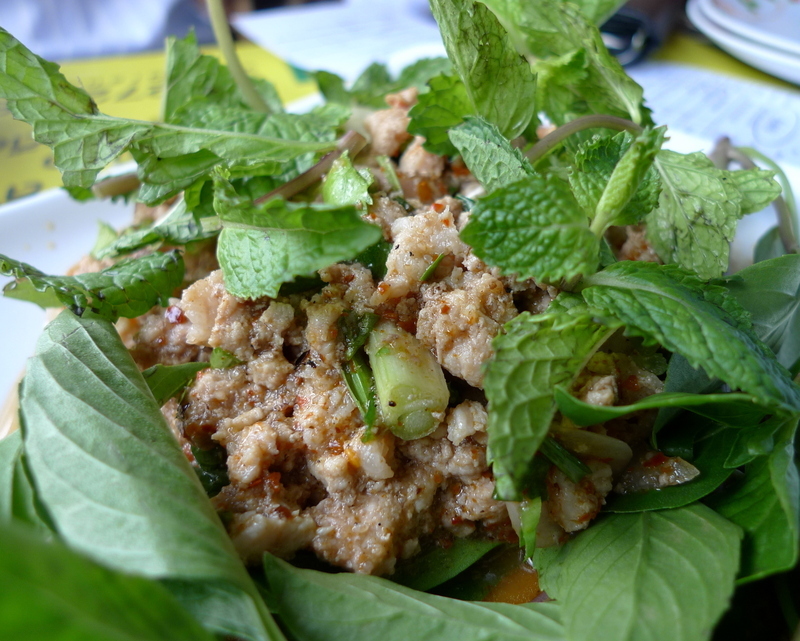 Usually made with ground pork (although you can make it with other meats) the salad has ground toasted rice grains, shallots, green onions, lime juice, fish sauce, and chili flakes fried together then served on a bed of basil and mint. Varying degrees of spice but always a very flavorful dish. For a special treat, we ordered a grilled Northern Style pork sausage. The meat is heavily spiced and flavorful. 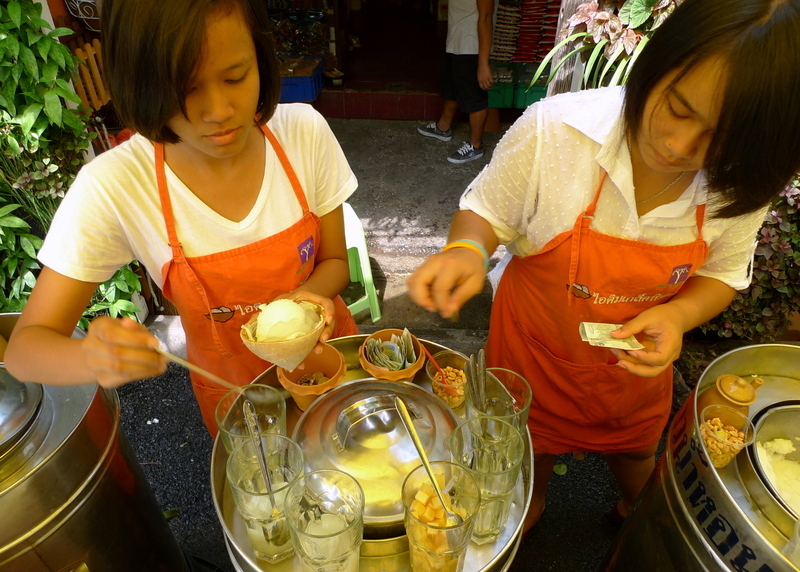 After lunch we headed across the walkway to a vendor serving homemade coconut ice cream. Their twist is that they serve the ice cream in half a young coconut shell with the meat from the coconut shaved out to accompany your ice cream. 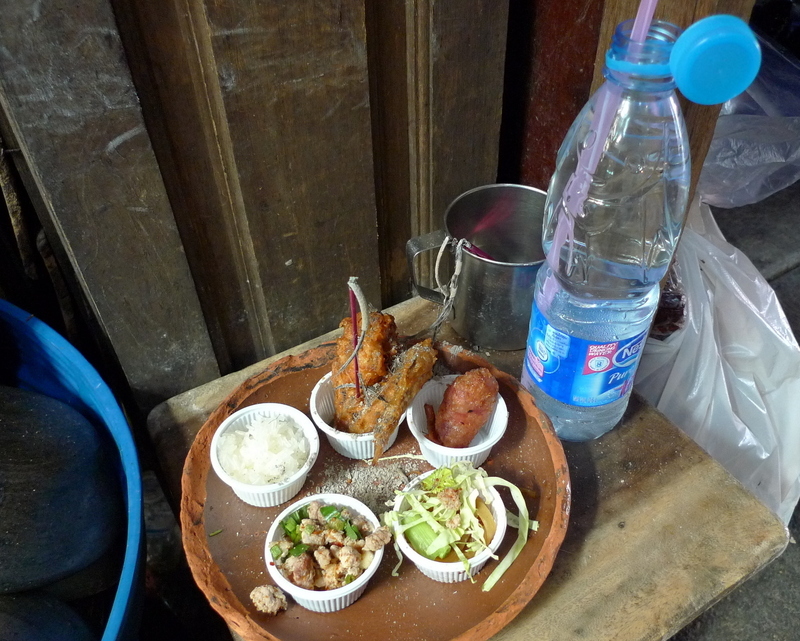 You can choose from a variety of toppings: boiled water chestnuts, hearts of palm, peanuts, condensed milk, etc. Coconut ice cream with young coconut meat, hearts of palm, and peanuts. Refreshing! This entry was posted in Uncategorized and tagged Bangkok, Chatuchak, Dining, food, Foon Talob, Issan, Jatujak, Krungthep, Thailand by christao408. Bookmark the permalink. fukkk! i love thai food.. LOOVEE!! mint, basil, chilies, sour, sweet, so fresh, so rawwwww and teach me how to make their ice tea.. how do i make it ? what do i need? Dude. Not fair, it’s 3 AM here and I am hungry for Thai food! I love the dried little shrimp bits in som tum. Coconut icecream?! I want to try some. I love your reviews. I admit – I kept thinking how different cultures can be … my mind can’t quite wrap around coconut ice cream served in a coconut shell. Very different – but intriguing! Loved the video! What does green papaya taste like? Is it like green mangos when it makes your teeth squeek? @christao408 – Always! Then again, I never really put up warnings for my food posts either. lol. wow, looks great! green papaya salad is delicious. hahaha who’d have thought fried chicken was so universal! Tawn did a great job narrating. Food looks great. Made me hungry. @murisopsis – Very similar, but a little less squeeky. @kunhuo42 – Who would have though, indeed! @Toro69 – Glad you liked it. I’ll pass the compliment on to Tawn and hopefully we can get him to narrate more. @OhItWontBeForever – *Blush* I’m glad you liked it. @Passionflwr86 – Kind of the “reduce, reuse, recycle” thing put into practice, eh? @Dezinerdreams – Is it not common there? I figured it would be. @bejewel07 – If only I could share some with you! What does green papaya taste like? Is it still sweet? 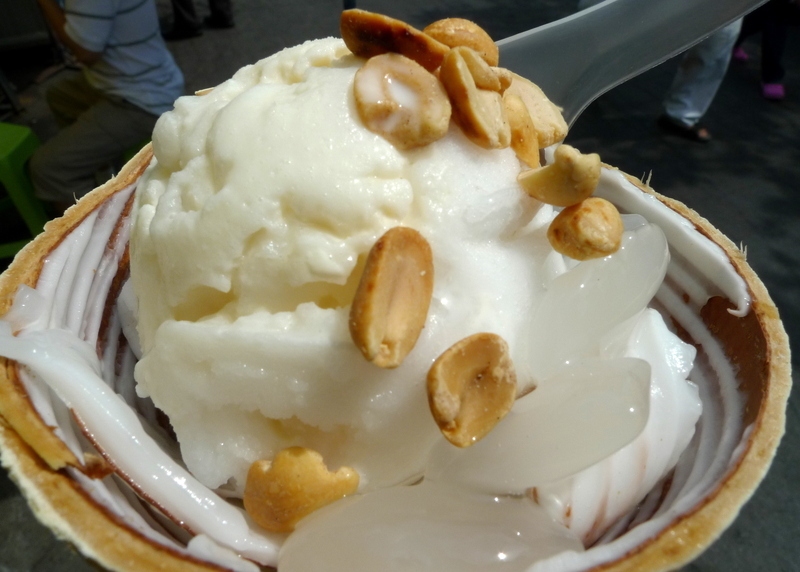 @christao408 – Coconut is quite common in my home-state and it’s cuisines- but ice cream? NO! The crispy fried chicken looks so tempting and the ice cream for dessert adds up for a satisfaction guaranteed meal!!! What a superb gastronomic treat!!! Man, how does a post from you STILL makes me hungry ever after I just ate? Oh Tawn! You can have my heart any time!! Loved the way he described the whole thing. I could almost smell the frying of chicken and the aroma of tangy papaya salad. I have to try that coconut ice cream with the sweetened heart of palm. That fried chicken… you guys always make me salivate. @TheCheshireGrins – Kind of like green apples combined with cucumber – the crispness of the apple and a little tartness, but a bit blander like cucumber. @ElusiveWords – Mission accomplished. @ZSA_MD – I’ll pass on your nice words, Zakiah. Thank you. @Roadlesstaken – Dunno. Miracles never cease to amaze me, though. =D@Wangium – And we didn’t even order particularly spicy. @icapillas – Glad you enjoyed! @CurryPuffy – That place it just too hot for me. An early morning run to the chicken restaurant is about all I can handle. @Dezinerdreams – Very interesting. I’ve learned something new today. @yang1815 – It was. Come try it. They all look so good! 😀 I love sticky rice, I used to attend a Lao church and they would have a potluck after the service every Sunday, so I ate a lot of different but good food 🙂 Thanks for posting these, from one foodie to another, I dig it. @NVPhotography – Glad you enjoyed. A Lao church potluck would certainly be good eating! the damn fried chicken looks bloody good from here. sigh… i’m hungry. @Sinful_Sundae – I have no idea where the Paula Deen comment came from! @christao408 – hehehe but it’s so cute!!! I heart you guys!! !